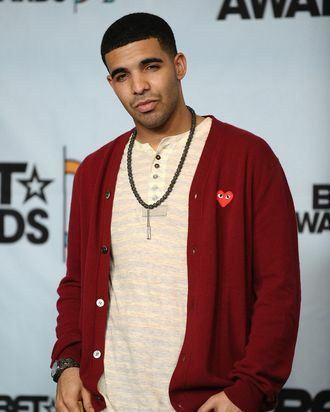 We here at Vulture have saluted Drake on his tremendous sweater game before. So last night we were very happy to hear him admit what we’ve all known all along: Drake really, really loves sweaters. Though the musician was dressed a little fancier — all-black suit — at Versace’s Fashion’s Night Out party, he did, somewhat abashedly, cop to owning more than 1,000 sweaters, everything from Tom Ford and Hermès cashmere to casual hoodies, zip-ups, and university sweatshirts. “I like sweaters. 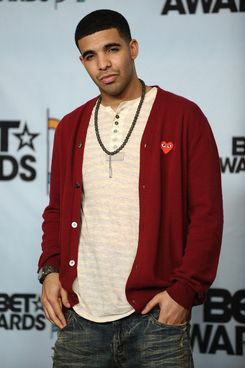 I have a sweater obsession, I guess,” Drake said. Though he was adamant that he doesn’t wear sweaters all the time — “Look, I wore a winter sweater on the MTV awards and everyone thinks I wear sweaters every day” — his sweater interest is nonetheless very, very real. “I know this will just feed into what everyone is saying, but I love sweaters,” he said. “I don’t know, that’s honestly my favorite clothing item.” As it should be, Drake. You wear them well.